I was listening to the EntreLeadership Podcast, and in the episode with Stephen M. R. Covey, Stephen talks about a topic that I believe is so crucial in a school environment – Trust. He has a new book out – The SPEED of Trust: The One Thing That Changes Everything that I plan on reading soon. One of the ways he feels a leader can build trust is in the area of delegating. He encourages leaders to not just delegate tasks, but to delegate results. As leaders, we find often find ourselves delegating responsibilities and tasks to people, and we tell them what they need to do. We spell out the details of the task, and there is not really any thinking or problem-solving that the person has to do. By delegating results, however, we not only help the person to develop some critical thinking and problem-solving skills, we demonstrate trust, and trust (or lack of trust) plays a significant role in any organization. Delegating tasks requires only the bare minimum amount of trust. By delegating a task, we’re trusting that the person is “capable” of following through with the instructions. We demonstrate that the person is competent enough to do what we ask. When we delegate results, we are demonstrating that we trust that the person is not only is competent, but is intelligent and creative enough to figure out how to get something done. For example, let’s say that you get a report that students are having their bikes tampered with after they’ve locked it up in the bike rack. You call in your security person to discuss the matter. Which of the two conversations demonstrates trust better? Which of the two conversations made the security person feel more valued? Which conversation will get the best effort out of the security person? The problem is that in many organizations and businesses, people are used to be given simple instructions. They get the instructions and follow them. Yes, there is a level of trust that is demonstrated, but not enough to get the person to truly feel a valued part of the organization. In the case of the security person, he might feel a little slighted by the first conversation, because he’s being asked to babysit the bike rack. With the second conversation, however, the security person is given the responsibility and an opportunity to solve a problem. He’s being trusted to come up with a solution. Perhaps, he comes back with some really lame suggestions. Maybe, he’s not good at problem-solving. In that case, you as a leader have an opportunity to develop his skills. It’s one of those teachable moments that we as educators love. In any case, you are making him feel like he is a member of a team, and not just an employee. By delegating results, you strengthen the bridge between you and your team members. You demonstrate trust, and as a by-product, you lesson your load. You don’t have to figure things out, when you allow others to figure it out for you. You’d be surprised how creative and talented some of your people are if only given the opportunity to show off what they can do. Thank you for all you do. 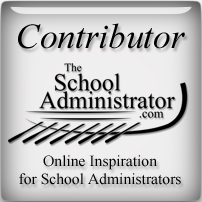 School administrators really do work that matters.